Garibaldi, OR. – Calling all anglers, get out your waders and seafood bib! There are only a few guided seats left and Tillamook Estuaries Partnership invites you to its 15th annual fundraiser, Bounty on the Bay. 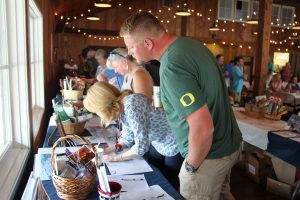 The funds raised at this event support education, restoration and conservation activities in Tillamook County’s estuaries and watersheds. Join us for an Italian pasta dinner and fishing tips & tricks workshop presented by one David Johnson, Friday, June 8th. On Saturday, June 9th, the fishing tournament begins and you can still register to fish with one of our guides or as your own captain. Everyone will enjoy a World-Class seafood feast, silent auction, and award ceremony that highlights the event on Saturday evening, June 9th. 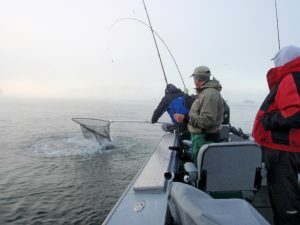 This action-packed fundraiser helps to support TEP’s efforts to implement the Tillamook Bay Comprehensive Conservation and Management Plan (CCMP), which identifies actions that restore water quality, enhance degraded habitats, reduce sedimentation and lessen the impacts of coastal flooding—all of which means more fish, better water quality, and improved natural habitat for wildlife and people! Whether you are interested in fishing or just joining us for one (or two) of the dinners, and snagging something wonderful during our silent auction on Saturday – we have something for everyone. Garibaldi House Inn and Suites, the official hotel of Bounty on the Bay, is offering discounted rates for Friday and Saturday night stays if you mention Bounty on the Bay.